This warming spicy stew is ready in 30 minutes - great for family dinners and feeding friends. Replace the bulgur wheat with couscous if you don’t have time to soak it overnight. For the chicken tagine, heat a large heavy-bottomed saucepan until hot. Add a little olive oil and the chicken thighs, skin-side down, and fry until golden-brown, then flip over and brown on the other side before transferring to a plate. Add the onion, garlic and ginger to the pan and gently fry for 2-3 minutes. Add all the spices and cook for a minute, then return the chicken to the pan and stir well to coat. Add the stock, chilli, tomatoes and honey and bring to the boil. Reduce the heat to a simmer, cover and cook for 20 minutes, or until the chicken is cooked through. 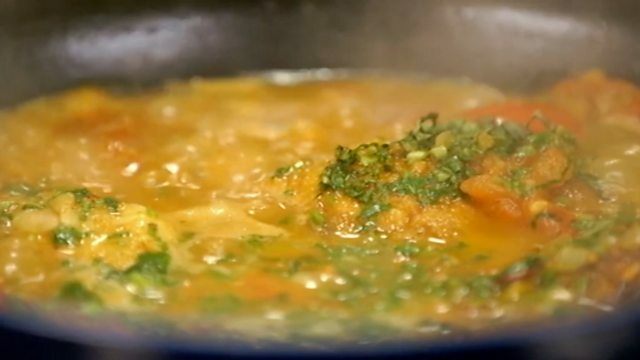 Add the mint and coriander, then stir in the butter. Season, to taste, with salt and pepper. For the pomegranate tabbouleh, drain the bulgur wheat well, pressing down lightly to ensure all the water is removed, then place into a large bowl. Add all the other ingredients and mix well, then check the seasoning, adding salt and pepper to taste. To serve, pile the tabbouleh onto plates and spoon a chicken thigh and some sauce alongside.